Grandma Poss makes bush magic. And her best trick of all is making Hush invisible. Now Hush will truly be safe from snakes.But one day Hush wants to become visible again. Grandma Poss looks and looks, but she can't find the right magic. Then she remembers. It's something to do with food! People food--not possum food. So the two set off on what becomes a fascination culinary tour of the cities of Australia to find the magic that will make Hush visible again. 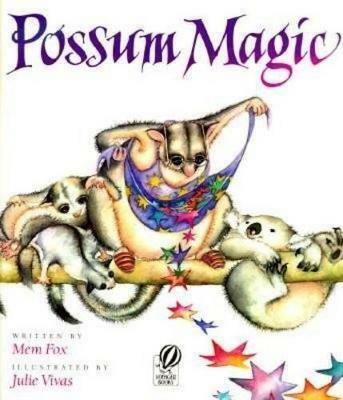 MEM FOX is the author of many acclaimed books, including Ten Little Fingers and Ten Little Toes, Possum Magic, Koala Lou, Time for Bed, and, for adults, Reading Magic: Why Reading Aloud to Our Children Will Change Their Lives Forever. She lives in Adelaide, Australia. JULIE VIVAS is illustrator of I Went Walking, Let's Go Visiting, the Mem Fox classics Wilfrid Gordon McDonald Partridge and Possum Magic, and several other picture book titles. She lives in Australia.